American scouts specialized in Indian costumes and dances. From the book "Jamboree Souvenir Pictures". New Horizons floral bed at the main gateway. 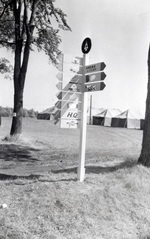 From the book "Jamboree Souvenir Pictures". Ontario Hydro's Floral Clock at Queenston. From the book "Jamboree Souvenir Pictures". Old Fort George was a popular rendezvous. From the book "Jamboree Souvenir Pictures". Teh thousand scouts saw the might Niagara Falls. From the book "Jamboree Souvenir Pictures". A cardinal conducts mass before an open air altar. From the book "Jamboree Souvenir Pictures". Three thousand attended service at historic St. Mark's in Niagara. From the book "Jamboree Souvenir Pictures". Jamboree camp chief purchases first panel of commemorative postage stamps. From the book "Jamboree Souvenir Pictures". Jamboree Post Office. From the book "Jamboree Souvenir Pictures". American scouts find old cannon ball from the War of 1812. From the book "Jamboree Souvenir Pictures". Brazilian scouts arrive at Jamboree in a jeep. From the book "Jamboree Souvenir Pictures". Scouts meet scouts from other lands. From the book "Jamboree Souvenir Pictures". The Dominican Republic contingent. From the book "Jamboree Souvenir Pictures". The Haiti contingent band displays unique instruments. From the book "Jamboree Souvenir Pictures". Such swapping sessions were evident everywhere. From the book "Jamboree Souvenir Pictures". Barbados scouts erect a fence of palm fronds. From the book "Jamboree Souvenir Pictures". Scouts from Kuwait (Persian Gulf) trade autographs with Canadian lady cubmasters. From the book "Jamboree Souvenir Pictures". The German contingent rehearses its arena display. From the book "Jamboree Souvenir Pictures". Rocky Mountain sub-camp scouts parade to opening ceremonies. From the book "Jamboree Souvenir Pictures". Canadian scouts demonstrate Indian war dances. From the book "Jamboree Souvenir Pictures". French scouts second storey sleeping quarters. From the book "Jamboree Souvenir Pictures". First patient in Jamboree hospital is a Curacao scout. From the book "Jamboree Souvenir Pictures". The Mexican scout minstrels (Quatros) were a big hit. From the book "Jamboree Souvenir Pictures". Canada's French-speaking scouts rehearse for pageant "Fragments of Canadian History". From the book "Jamboree Souvenir Pictures". Lord Rowallan presents an original BP water colour to Canada through Jamboree camp chief. From the book "Jamboree Souvenir Pictures". 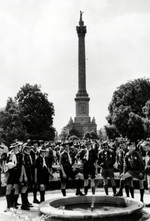 On the historic tours, scouts climbed the 185 foot Brock's Monument at Queenston. From the book "Jamboree Souvenir Pictures". 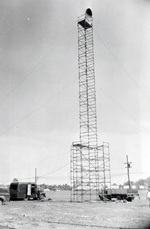 From this tower television programmes were beamed across Canada and the United States. From the book "Jamboree Souvenir Pictures". 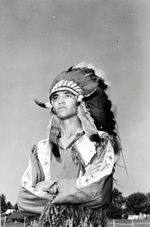 An American Indian costume modelled by a scout from the U.S.A. From the book "Jamboree Souvenir Pictures". 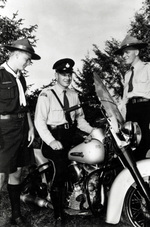 The Royal Canadian Mounted Police, the Ontario Provincial Police, Rover scouts and scouters formed the Jamboree security forces. From the book "Jamboree Souvenir Pictures". The Florist telegraph delivery association paid this floral tribute to the Jamboree. From the book "Jamboree Souvenir Pictures". 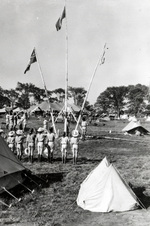 Flag break on a contingent camp site. From the book "Jamboree Souvenir Pictures". The gateway at the Curacao contingent camp site. From the book "Jamboree Souvenir Pictures". Sign language overcame ordinary language barriers. From the book "Jamboree Souvenir Pictures". 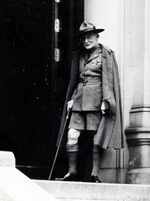 Lord Baden-Powell the founder of the Boy Scout movement, the man who made jamborees possible. From the book "Jamboree Souvenir Pictures". Aerial view of the camp from the book "Jamboree Souvenir Pictures". Canada's Govenor General and Chief Scout Officially opens Jamboree. From the book "Jamboree Souvenir Pictures". Olave Lady Baden-Powell, Chief Guide of the World. From the book "Jamboree Souvenir Pictures". Representatives of national contingents around floral emblem in flag plaza. From the book "Jamboree Souvenir Pictures". Presentation of contingent souvenir plaque to jamboree camp chief. From the book "Jamboree Souvenir Pictures". 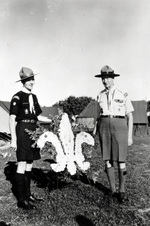 A presentation to American chief scout executive, Dr. A.L. Schuck. From the book "Jamboree Souvenir Pictures". Lord Rowallan, Commonwealth and Empire Chief Scout, at Bristish contingent tea party. From the book "Jamboree Souvenir Pictures". Korea's sole representative welcomed to Jamboree. From the book "Jamboree Souvenir Pictures". Hand carved totem poles from British Columbia From the book "Jamboree Souvenir Pictures". The tri-service medical and nursing staff at Jamboree hospital. From the book "Jamboree Souvenir Pictures". Town of Niagara's "Parliament Oaks" school served as the Jamboree hospital. From the book "Jamboree Souvenir Pictures". 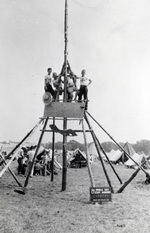 Jamboree fire fighting service. From the book "Jamboree Souvenir Pictures". A view of the popular trading post. From the book "Jamboree Souvenir Pictures". Part of the contingent from India at lunch. From the book "Jamboree Souvenir Pictures". From beyond the arctic circle came these Indian and Eskimo scouts. From the book "Jamboree Souvenir Pictures". 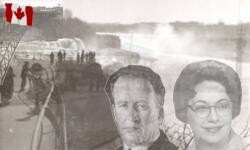 50 records found in Images database. Displaying 1 to 50.